Greek Parliament begins deliberating the NATO accession protocol for Macedonia today. Under the Prespa agreement, it is now up to Greece to ratify the protocol, and with that to remove the veto it imposed on Macedonia’s NATO accession in 2008. The protocol, which the Greek Ambassador to NATO signed along the other NATO members on Wednesday, is sent before the Parliament Defense and Foreign Affairs Committee. 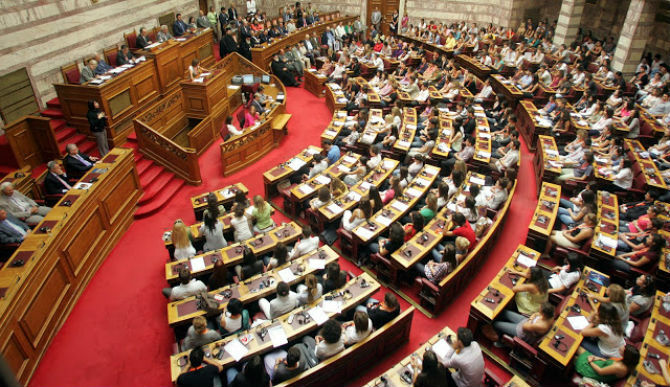 Ruling SYRIZA party representative Nikos Toskas and Giorgos Koumoutsakos from the opposition New Democracy party will report on the protocol, and on Friday the Parliament is expected to vote on it. Prime Minister Tsipras had a narrow, two vote majority for ratifying the Prespa agreement and he would have to keep his caucus in line in order to ratify the NATO protocol, which would be the first major concession on the part of Greece, after Macedonia forced through a name change and agreed to open its history books and public discourse to Greek interpretation and censorship. Other NATO members, who haven’t expressed major reservations to Macedonia’s membership, are expected to ratify the treaty in the usual procedure which can take up to a year, but Greece is called to do it immediately, and only after it is ratified, Macedonia would notify other countries that it now goes under a new name. Panos Kammenos, who left the Tsipras Government in protest against the Prespa agreement, demands that the protocol is ratified with a super-majority of 180 votes, instead of 151 in the 300 seat Parliament. He also called on New Democracy to support a joint push to question the constitutionality of the ratification procedure.